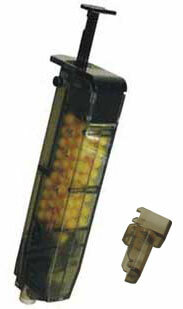 Blister pack speedloader complete with pistol magazine adaptor. Choosing an Airsoft Gun: Although there are only 3 types of Airsoft guns available, gas, electric and spring, each type has different versions with added features and extras. Making a decision on the type of Airsoft gun to purchase will ultimately depend on the reason you want the gun, whether it is for practicing shooting at targets or playing in a game with other players. Read full article.